WYW BLOCK Zrt produces light concrete dividing walls, bricks, roof structures and steel profiles for energy efficient building structures. We have set up a demo center of 800 m2, where contractors can get to know the methods of using polystyrene light concrete. This way they can apply it properly during their work for instance, in many construction projects, insulation, fire protection, renovation of detached and attached houses, community buildings (nurseries, schools, gyms, etc. ), agricultural buildings (refrigerated storage, animal husbandry facilities, etc.). The activities in the factory include R&D and innovation. We are looking for new, Eco-friendly and energy saving solutions, for example, production of construction material from recycled waste (plastic, EPS). To apply polystyrene light concrete in construction technologies, we need professional structure planning. We are constantly improving the planning solutions. In addition to material production, training, R&D and structure planning, our company sells production lines and production know-how related to the technology outside Hungary. We hereby inform our Dear Customers that WYW BLOCK Zrt. markets the WYW BLOCK Optimum and Green „brick” masonry unit 30 and 38 products under the WYW Block brand name as well. certain energy rating ask for the help of a building energetics expert). What’s more, energy efficiency plays an important role in our production, too. Durable - The durability of polystyrene light concrete rivals that of conventional concrete. application, any waste created is reusable. Excellent fire safety - The 41 cm thick wall, made with steel load-bearing structure and with the proper plaster, can achieve A1 fire safety classification, it is able to hold back fires burning at 1 000 °C for 240 minutes. Area of application: Construction of infilling (30, 38) wall structures and load-bearing (38) wall structures of two-story buildings in detached family houses, and internal and external walls in blocks of flats (under specified conditions). In case you would like a single-story or two-story, energy efficient, quickly build house, we recommend the insulating brick manufactured by our company, which is suitable for building the wall structures of family homes. 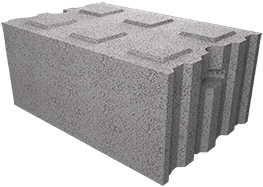 The WYW Block masonry unit is perfect for the construction of infilling walls of buildings with steel or concrete pillar structures, thereby creating a building with excellent insulation and fire safety. The WYW Block masonry unit enables faster construction of taller buildings and bigger apartment buildings compared to traditional technologies. Also, the product allows making these buildings energy efficient with AA+ energy rating (to achieve a certain energy rating we recommend asking for the help of a building energetics expert). Area of application: Construction of residential and public buildings, exterior and interior load bearing and non-load bearing walls, basement ceiling, floor and roof slabs, slabs of non-converted attics, supporting and enclosing structures, enclosing structures of the roof slab, partition wall. Area of application: Facade insulation systems and as an insulating layer of flat roofs. *Not to be considered as a formal quotation! All contents are for information purposes only! Guarantee: We guarantee the quality of our manufactured products in accordance with law V. of year 2013 (Hungarian Civil Code) and Directive 1999/44/EC. We have product liability insurance for our manufactured products extended to the territory of Europe at the Generali Insurance Company. Headquarters: 1163 Budapest, Feldebrő u. 7. Headquarters: 1194 Budapest, Tulipán u. 59. Headquarters: 6753 Szeged, Budai Nagy Antal u. 60. Company: Mester - BauHolding Kft. Headquarters: 6900 Makó, Rákóczi u. 33. Company: A Plus Homes Kft. Headquarters: 2230 Gyömrő, Pázmány Péter u. 33. Company: N + N Bau Trade Kft. Headquarters: 6763 Szatymaz, II. körzet tanya 1741. Headquarters: 6794 Üllés, Vásártér utca 22. Headquarters: 6750 Algyő, Tűzér u. 12. Headquarters: 6725 Szeged, Csöndes utca 9. tt 9. Company: Sümegi és Társa Kft. Headquarters: 6422 Tompa, Attila u. 164. Headquarters: 6000 Kecskemét, Beretvás köz 7. Headquarters: 6726 Szeged, Műhely u. 24. Company: Szabó General Builder Kft. Headquarters: 6900 Makó, Nyízsnyay u 21. Headquarters: 6756 Tiszasziget, Dózsa György utca 10. Headquarters: 1118 Budapest, Késmárki utca 8. Headquarters: 2700 Cegléd, Hold utca 12. Headquarters: 6795 Bordány, Bartók Béla u 4. Headquarters: 6422 Tompa, Zrínyi utca 10. Headquarters: 6000 Kecskemét, János Vitéz u. 6. Headquarters: 8887 Bázakerettye, Dózsa György út 5. To view the houses and models click on the picture! Please note that Declarations of Performance are invalid without the authentication of the manufacturer. 20-CPR-56-(C-31/2014) can be viewed at www.emi.hu website. Löglen construction technology is under definitive patent protection (application no. : P0800701, reg. no. : 228967), which can be viewed on the website of the Hungarian Intellectual Property Office (www.sztnh.gov.hu/en).